Premier's management is now in our 30th year of selling cruise vacations. Premier is one of the largest travel agencies specializing in the sale of river cruise vacations. We've built our reputation on professionalism, remarkable service and an ability to provide exceptional values. While we know that many people shop only for price, we do think that there are many other very important elements that need to be considered before you select your river cruise trip [No matter what the price is, it's a lot of money]. At Premier we will make sure you understand ALL the subtle differences between each cruise line and even each ship — and there are many. You'll also receive your own copy of our COMPASSPOINT™ Guide Series, Premier's exclusive planning, preparation and destination guide written by our staff and focused right on your chosen itinerary. It is without a doubt all you need to get ready for your trip, and to maximize your enjoyment of each port you visit, we call it our "river cruising for dummies" book. While our service and expertise is truly unmatched by any other travel agency, we will also guarantee you have the best possible value. 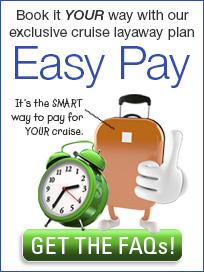 Our "Best Price Guarantee" is available to travelers who have booked or intend to book a cruise with Premier. It's really very simple; if you find a lower published rate through another website or direct mail piece prior to booking or within 14 days of your booking, we'll match or beat it, AND give you $100 in Onboard Cash! NEED WE SAY ANY MORE? You must make a request for a price adjustment. If your request is approved, we will match or beat the rate, or if you have already paid in full, we will refund the difference. ◙ Complete offer details and company name/Web address (URL) reflecting the lower rate you found. Book Early Low Price Assurance Program. River cruising is the fastest growing element of the cruise industry, and because of this, many river cruises sell out very quickly. Unlike ocean cruises, you MUST book almost a year in advance to enjoy prime season sailings between May and September. The obvious benefit of booking early is you pick the best cabin location and get the BEST price. Yet some people are still reluctant to book early and are very often disappointed when their preferred cruise is SOLD OUT. Many people have taken ocean cruises before know that if you wait unitl the "last minute," they can sometimes get a better price. Because river cruising is so popular and the ships only hold 150 or so guests, this is just not the case. So, to encourage our customers to book early, Premier River Cruises now offers a Price Assurance program that removes any risk of booking early. What that means to you is that you can now book early with confidence. Should the cruise line lower the price of your cruise departure, we guarantee you'll get the lower price and we'll refund the difference to you. No strings, no hoops to jump through, just good common sense. 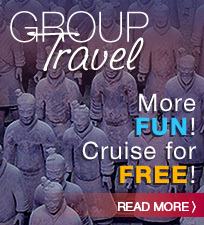 No other travel agency specializing in river cruise vacations does this. It's just another reason you should book with Premier, the best travel agency in American to arrange your river cruise vacation. Any price quoted on the Premier River Cruise site or by one of our river cruise experts is per person, based on double occupancy, subject to availability at the time of receipt of your payment and do not include taxes, fees, fuel surcharges, gratuities, or airfare unless otherwise noted. Prices, fees, and other restrictions are subject to supplier policies. 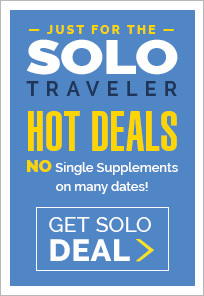 All offers, including but not limited to, bonus amenities, upgrades, prices, and group benefits are based on select dates, ships, cabin categories, and/or fare codes are capacity-controlled, and subject to change without notice. You may be subject to cancelation penalties, blackout dates, and other restrictions may apply. Savings shown are based on suppliers' published brochure rates. Offers may not be combined with other offers. Offers are applicable on new bookings only. Canceled and/or rebooked cruises would not qualify and additional restrictions may apply. Travelers receiving special rates based on state of residency, age, birth date or anniversary programs under Premier’s Milestone Event program, etc., will be required to show an appropriate and/or government-issued form of identification (i.e. passport, birth certificate, driver's license, marriage license, etc.) 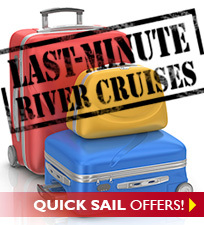 upon check-in or to Premier River Cruises to validate the applicable discount. If a traveler does not provide proper identification they will either be denied boarding at check-in or will be charged the current standard price. Air-inclusive prices do not include government imposed taxes and fees, including but not limited to a September 11th Security Fee, U.S. or international government imposed taxes and fees, Federal Excise Fees, among others. Some carriers charge additional fees for checked bags, fuel surcharge, meals, etc. Please check the appropriate carriers' websites for details. We carefully monitor all of the information provided on our website; however, we are not responsible for any errors or omissions resulting in inventory, content, images, or pricing discrepancies. The information shown, including any pictures is for informational purposes only and may not be used by any unauthorized party without the express written consent of Premier River Cruises. 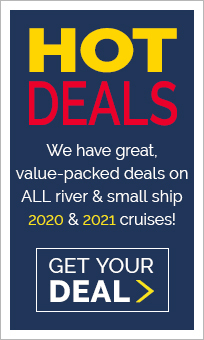 Eligibility to invoke our price match only applies to the same ship, sailing date, and cabin category as booked through Premier River Cruises. Claims are eligible only if the lower rate is available for booking at the time you contact Premier River Cruises and only if the lower rate is allowable within supplier guidelines for re-booking and/or re-pricing. The Premier River Cruises Best Price Guarantee and Price Assurance programs apply only to advertised rates that are available to the general public, posted on another website or in a direct mail piece. Specifically excluded from Best Price Guarantee are; group, charter, incentive, meeting, convention, interline or Military rates, etc. The Premier River Cruises Best Price Guarantee only applies if you meet all requirements of the lower rate. For example: residency, regional, past-passenger, age-related requirements, etc. The Premier River Cruises Best Price Guarantee only applies to the cost of the cruise, including port charges. Additional items such as taxes, air or land add-ons, insurance, shipboard credits, transfers, pre- or post-cruise hotel stays, onboard amenities, gift cards or certificates, cash back, or dollars off are not eligible. The determination of should a request be honored is at the sole discretion of and subject to approval by Premier River Cruises and all decisions are final. Premier River Cruises will not accept screenshots or other purported evidence of a lower fare. Approved requests will receive credit to their booking credit card within 7-10 business days of approval, or via check. Premier's Early Booking price guarantee program applies only when the cruise line lowers the advertised price of the cruise [exact date, ship, category] you have reserved. Your booking must be paid in full and you must actually request a refund of the difference in price. Premier's Early Booking price guarantee does not apply to sailings that are scheduled to depart between October 15 and December 31 of any calendar year. Void where prohibited by law. Premier River Cruises reserves the right to modify or discontinue the Best Price Guarantee at any time without prior notice or liability. Any cancellation of this program will be effective upon removal of references to the Best Price Guarantee.